Pulitzer Prize winner Paula Vogel’s captivating new play with music took Broadway by storm and now Rebecca Taichman recreates her Tony Award-winning production for Boston audiences. Inspired by the true story of Sholem Asch’s controversial Broadway debut God of Vengeance — a play seen by some as a seminal work of Jewish culture and by others as an act of traitorous libel — and the passionate artists who risked their lives to perform it. Indecent is a riveting and richly theatrical backstage drama, a fierce indictment of censorship, and a celebration of art and love. 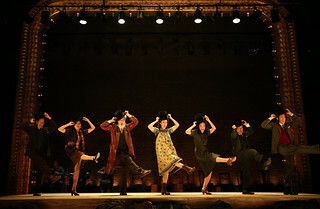 Get a sneak peek of the spellbinding Broadway hit Indecent. There is a story we want to tell you. I was sixteen in high school whenI realized I could forge my mother's signature on sick notes. 1907 In Warsaw, Sholem Asch reads his new play, Got fun Nekome (God of Vengeance), for the founding father of modern Yiddish literature, I. L. Peretz. Disturbed by what he takes to be the play's misrepresentation of Jewish piety, Peretz counsels Asch to "burn it." Paula Vogel’s Indecent (2019) and A Civil War Christmas (2009) have been produced by the Huntington. Rebecca Taichman won the 2017 Tony Award for Best Director of a Play for Indecent. David Dorfman has been artistic director of David Dorfman Dance since its 1987 founding. Elizabeth A. Davis was seen on Broadway in Once (Tony Award Nomination). Joby Earle has Broadway credits that include War Horse (Lincoln Center Theater). Harry Groener has Broadway credits that include Crazy For You, Oklahoma!, Cats, Harrigan and Hart, Oh Brother!, Is there Life After High School, Sleight of Hand, Sunday In The Park With George, Imaginary Friends, and Spamalot. Mimi Lieber previously appeared in Persephone (2007) and The Sisters Rosensweig (2005) at the Huntington. Richard Topol has Broadway credits that include Indecent, Fish in the Dark with Larry David, The Normal Heart, Awake and Sing!, The Merchant of Venice with Al Pacino, Cymbeline, The Country Girl, and Julius Caesar with Denzel Washington. Steven Rattazzi has appeared on Broadway in Indecent. Adina Verson appeared in Indecent on Broadway. Matt Darriau is an active woodwind specialist in New York City’s eclectic music scene. Patrick Farrell has theatre credits that include Beneath (BenFeng Arts Center, Tainan, Taiwan); Busk (Baryshnikov Arts Center); and Cyclone and the Pig-Faced Lady (New York Musical Theater Festival). Lisa Gutkin is the Grammy Award-winning violinist, singer, and songwriter of the renowned Klezmatics. Riccardo Hernandez previously designed the set for the Huntington's production of A Confederacy of Dunces (2015). Emily Rebholz has Broadway credits that include Getting the Band Back Together; Indecent; Dear Evan Hansen; Oh, Hello On Broadway; If/Then; Vanya and Sonia Masha and Spike; and Bloody Bloody Andrew Jackson. Christopher Akerlind previously designed lighting for Tartuffe (2017), Sunday in the Park with George (2016), All My Sons (2010), Shining City (2008), Well (2007), Seven Guitars (1995), The Young Man from Atlanta (1995) and The Piano Lesson (1988) at the Huntington. Matt Hubbs has Broadway credits that include Indecent (Cort Theatre) and Time and the Conways (American Airline Theater). Tal Yarden has current and recent projects that include Superhero (Second Stage Theater); Grey Rock (La MaMa); and Network (Belasco Theatre). J. Jared Janas designed the wigs, hair, and makeup for Man in the Ring (2018) at the Huntington. Rick Sordelet choreographed fights for Romeo and Juliet (2019), Man in the Ring (2018), Disgraced (2016), Mauritius (2006), Observe the Sons of Ulster Marching Towards the Somme (2002), and Dead End (2000) at the Huntington. Emily F. McMullen has stage managed over 25 shows for the Huntington over the past 5 years, including Romeo and Juliet (2019); A Doll's House, Part 2 (2018); Man in the Ring (2018); The Niceties (2018); Top Girls (2018); Bad Dates (2018); Tartuffe (2018); and Merrily We Roll Along (2017) last season. Kevin Schlagle previously worked on Romeo and Juliet (2019); Sherlock's Last Case (2018); Fall (2018); Skeleton Crew (2018); Tartuffe (2017); Merrily We Roll Along (2017); Ripcord (2017); Topdog/Underdog (2017); Bedroom Farce (2016); Sunday in the Park with George (2015); Can You Forgive Her? (2016); Milk Like Sugar (2016); A Confederacy of Dunces (2015); A Little Night Music (2015); after all the terrible things I do (2015); Come Back, Little Sheba (2015); Vanya and Sonia and Masha and Spike (2015); Smart People (2014); Venus in Fur (2014); Our Town (2012); God of Carnage (2012); Ruined (2011); and Prelude to a Kiss (2010) at the Huntington. Ashley Brooke Monroe worked on the original Broadway production of Indecent.